The recording studio at Fisher Lane started life as a Cowshed where the dairy herd was milked by the farmer who owned Fisher Lane Farm. In 1979 Dale Newman (guitar technician) was tasked by the band to look for somewhere the group could set up and record. The band were not strangers to recording or rehearsing at farms. Firstly at Glaspant Wales during the recording sessions for The Lamb Lies Down On Broadway in which they prepared material for the recording of the Lamb in Basing Street Studios (Island) in London. 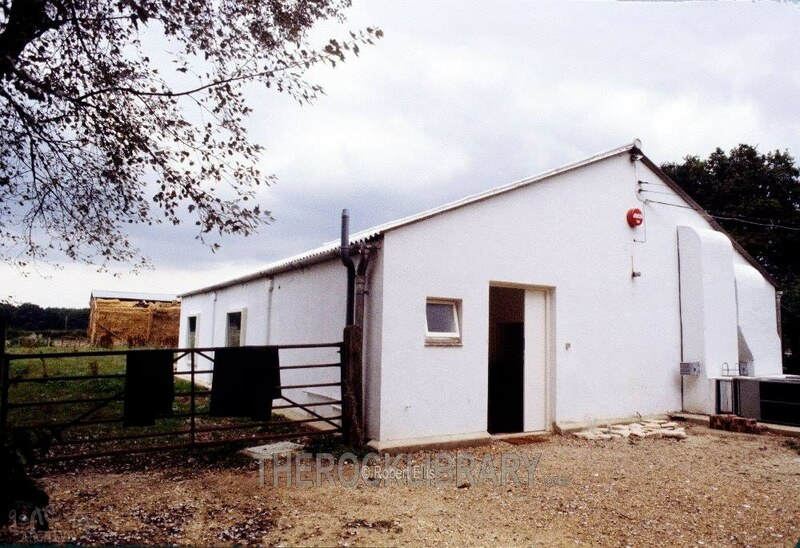 A few years later in November / December 1976 Genesis rehearsed at the The Farmyard Rehearsal Studios in Little Chalfont, Buckinghamshire for the Wind and Wuthering tour and they remarked to Robert Ellis (photographer) about how they would like a similar space of their own. Fisher Lane Farm house – 2016. Image copyright is Knight Frank. When Genesis purchased Fisher Lane Farm, it came with a Farmhouse (now a listed building) in which Genesis wrote a lot of Abacab (Album) inside, but mainly Genesis used the Farm house for interviews ranging from TV to magazines and even fanzines. On one occasion in June of 1990 the farmhouse was used by the band to rehearse their short set at The Nordorff Robbins music therapy charity show at Kenbworth park on the 30th June 1990. 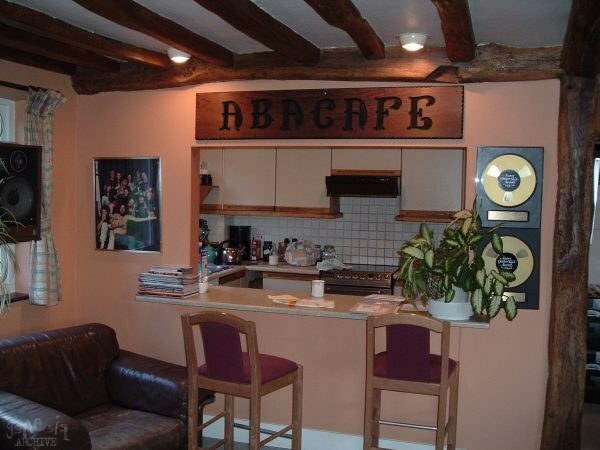 The farm house was as the band originally intended used to house road crew throughout its history and on the 1995/96 Mike and The Mechanics tours some of the band stayed over. In 2000 the Farmhouse and equipment barn, along with a few outbuildings were prepared for sale… this meant that a new access road was drawn up for the recording studio and the land partitioned complete with a fence separating the two, this sale was completed sometime in 2001. This farm studio space would only be realised after the 1978 world tour to promote the album And Then There Were Three. Trusted guitar technician Dale Newman throughout summer 1979 transversed Sussex visiting farms for sale and judging if any buildings on the land could be converted into a rehearsal/recording studio. Finally he found somewhere that suited the bands needs and it was at the end of the tour to promote the 1980 album Duke that the band must have acquired Fisher Lane Farm. Fisher Lane Farm must have been purchased by the band prior to the 15th October 1980, which was when they had the business name Fisher Lane Farm incepted as a limited company (liquidated as of 30th March 2016). The first album the group recorded at the original studio was Abacab, although they were writing this album initially at the farm’s house because the Cowshed studio was still being constructed and refurbished into a recording studio. 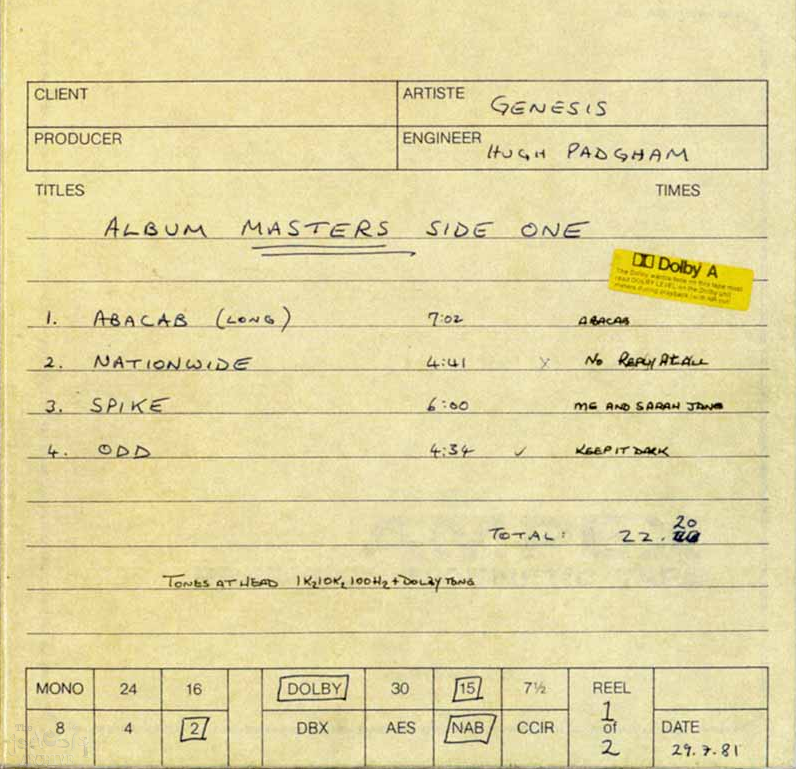 Genesis would release Abacab in September 1981, whilst the first phase of the original studio was just big enough for the needs of the band and crew. 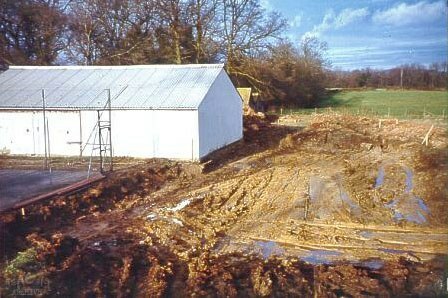 This image below kindly supplied by Robert Ellis shows how Fisher Lane Farm studio looked in September of 1981. Whilst the studio was in use, Genesis kept most of their equipment and instruments in the Sussex barn which came with the Farm house and there was also a workshop for equipment and instrument repairs jokingly titled “The Up All Night Dept” that the band crafted a wooden sign and attached it to this workshop. (A photo of which appears in the Invisible Touch tour programme with Phil posing next to the sign). Moving on to September 1981 making preparations for the Abacab tour these involved initial tour rehearsals which took place at the new studio. 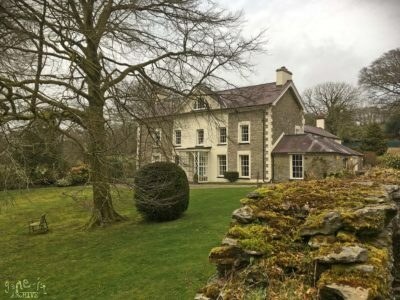 Whilst Daryl Stuermer and Chester Thompson might have stayed in the Farm house if there was any space after some of the loyal Genesis road crew had taken up residence (Dale Newman states in a later interview he lived at FLF for 10 years). 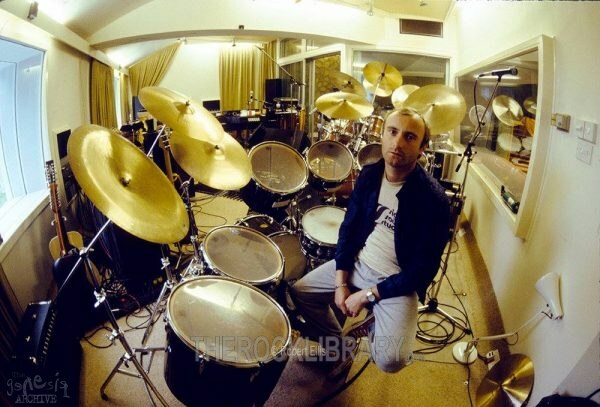 It was a tight squeeze for the band to get two drum kits, a keyboard / synthesiser tower, equipment for two guitarists / bassists and the vocal equipment for Phil’s voice, Genesis would continue to rehearse for tours using FLF with photographs available showing the Encore / Three Sides Live tour rehearsals beginning at FLF. By the time of the tour to support We Can’t Dance in March 1992 Genesis relocated their tour rehearsals to the Chiddingfold Working Mens Club (now demolished). The early version of the studio had an Amek desk in it and limited processing and editing equipment. This early incarnation of the studio was filmed by Phil Collins who was using his home video camera during the Mama album sessions. An edited version of this home video appeared as an extra on the The Movie Box set as an addition to the Mama Live film from the shows at the NEC near Birmingham. This fly on the wall thing Phil was trying to film lasts up to an hour and 20 minutes and it gives a real depth into some of the writing, recording, overdubbing, editing of the Mama album all at the original incarnation of FLF including the tiny kitchen where Dale Newman manages to rustle up some breakfast that Hugh Padgham can be seen to be eating. In 1984, not long after the recording sessions for the Phil Collins album No Jacket Required it was decided that Fisher Lane Farm should be expanded. This was duly put into the local authority who received it some time in 1984. Changes proposed were continued use of building as studio plus an erecting of an extension to provide an enlarged studio. 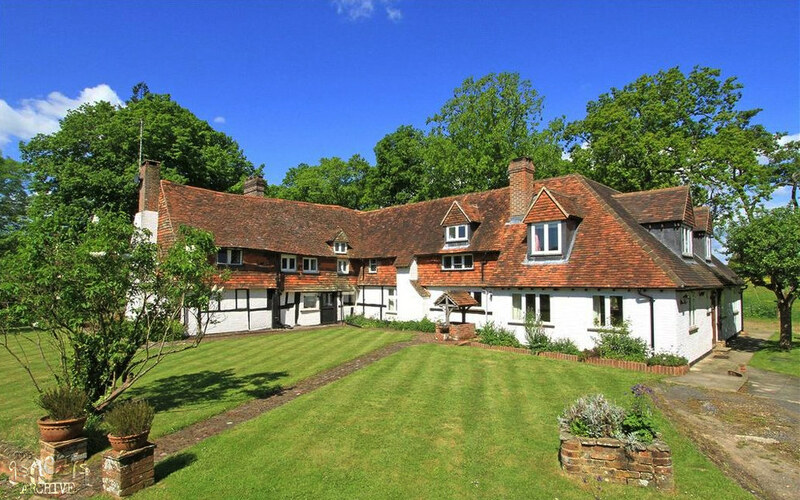 Reference number: WA/1984/1218 – Fisher Lane Farm, Fisher Lane, Chiddingfold, Surrey. Planning permission obtained, construction work began. Dale Newman took a number of photos of the site when the extensions’ construction was in progress and these can be seen below. The recreation room is part of the extension built-in 1985. 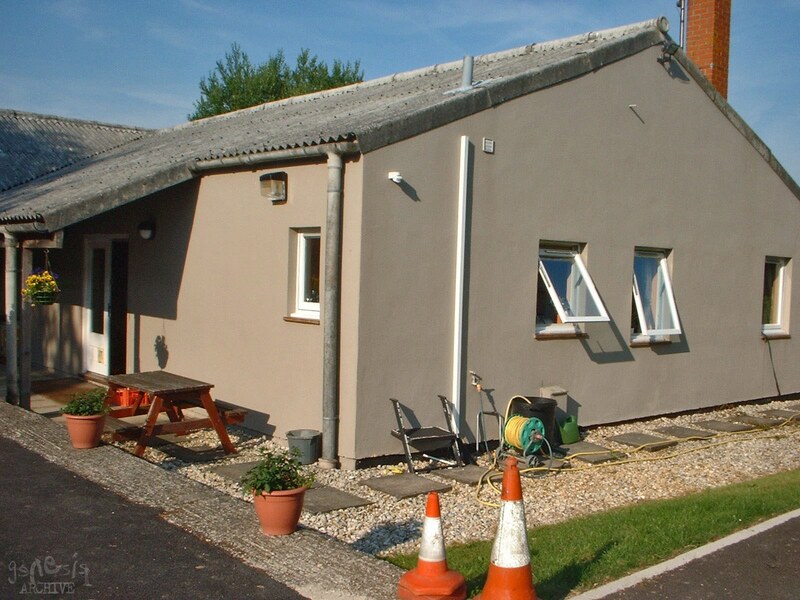 Originally, this part of the studio complex was designed to be on the other side of the building but, after getting planning permission for the original layout, it was decided to move the recreation area so that it was between the control room and the road. 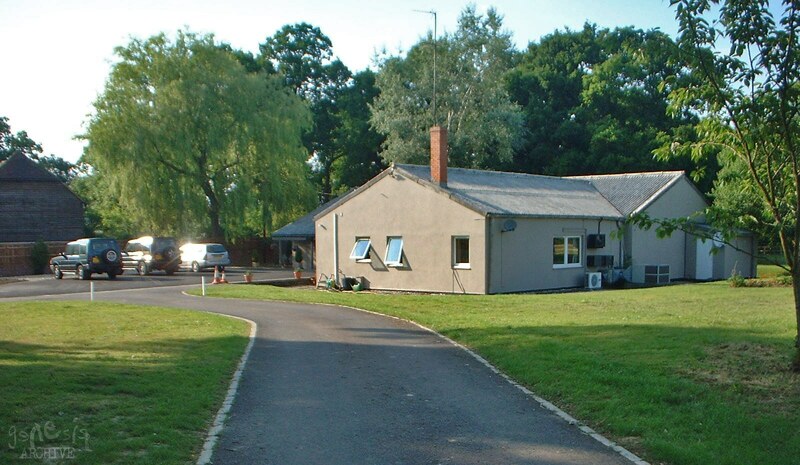 The area at the front contains the recreation area, kitchen, and bathroom facilities with the control room to the right hand side of this photo. Note: That’s a poster to promote A Trick Of The Tail (Charisma) and a UK Duke tour poster hung up in the lounge area. The new control room and the recreation room were added in 1985. The room was designed by a Japanese designer, Sam Toyishima from JVC. With two feet of sound absorbing materials built into the walls, the room was one of the original large control room designs in the UK. As Dale Newman remarked the builders made use of a concrete block called Lignacite which provided sound absorbance and other benefits (as quoted June 2006). When the Solid State Logic desk was delivered, the room was still being built. None of the windows were in and there were carpenters and builders crawling all over the place. In one respect the lack of windows was useful as the desk was brought in through the window. 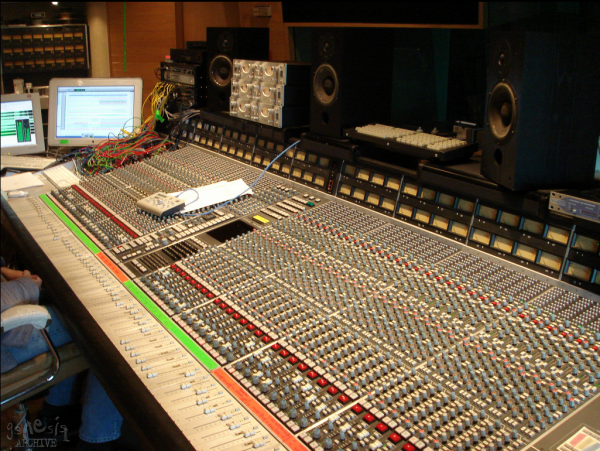 The SSL Desk at FLF June 2003. Dale Newman casually leans on it. The original design for the room was put together by Geoff Callingham and Dale Newman some two years before its eventual construction. 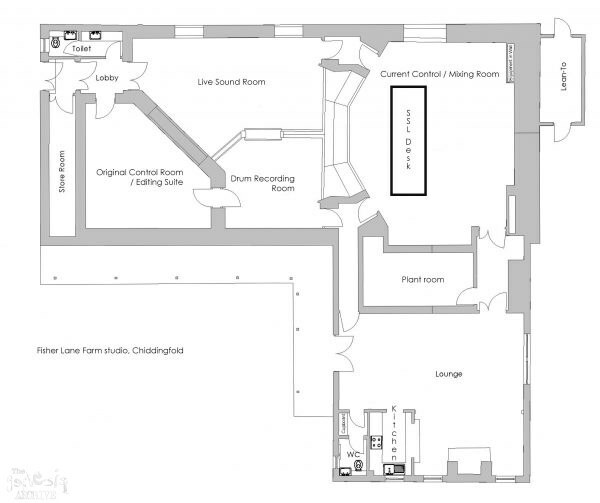 Originally, the recreation room was going to be on the other side of the control room and it was designated in the plans as an area for tape storage. Later, after planning permission had been given for the original layout, Dale concluded that it made more sense for the recreation room/tape store to swap sides and another planning application was put in and duly accepted. As building progressed it was the band who decided that tape storage was of lesser importance than somewhere to cook bacon sarnies and watch a bit of television and so the ‘tape store’ became the recreation room. 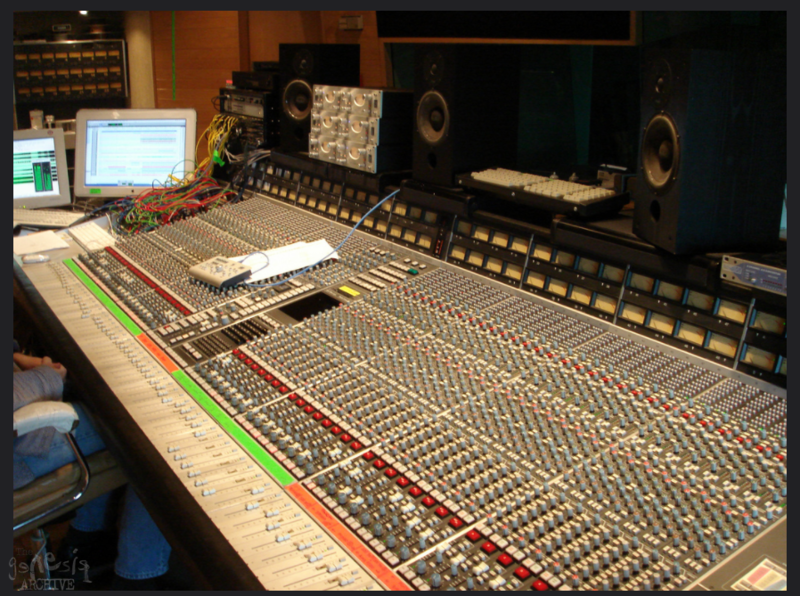 The new control room was built during the period that Mike was recording the first Mike and the Mechanics album. Some early recording of material was done at the Farm before everyone flew off to Montserrat to finish the project at Air Studios. In the meantime, and over a six month period, the new control room was finished. During the early Mechanics recording the building work caused no end of trouble. 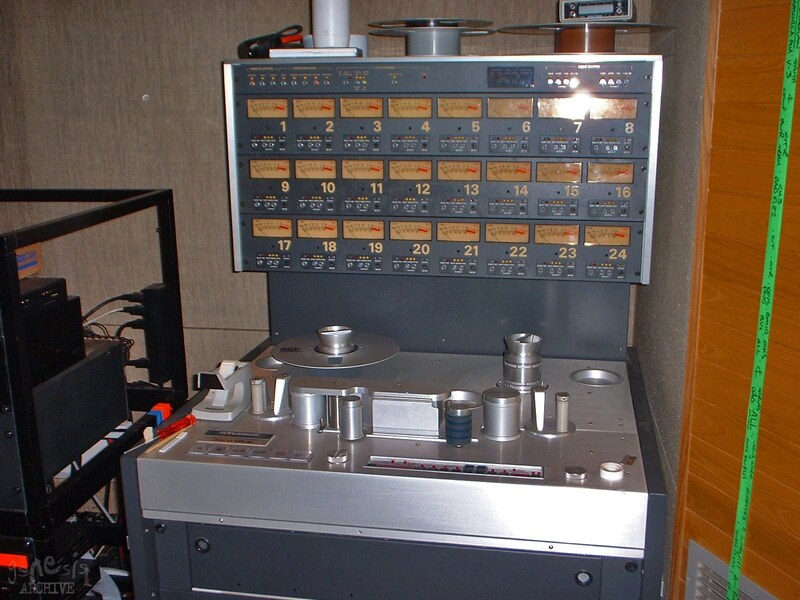 Firstly, two new tape machines were delivered. 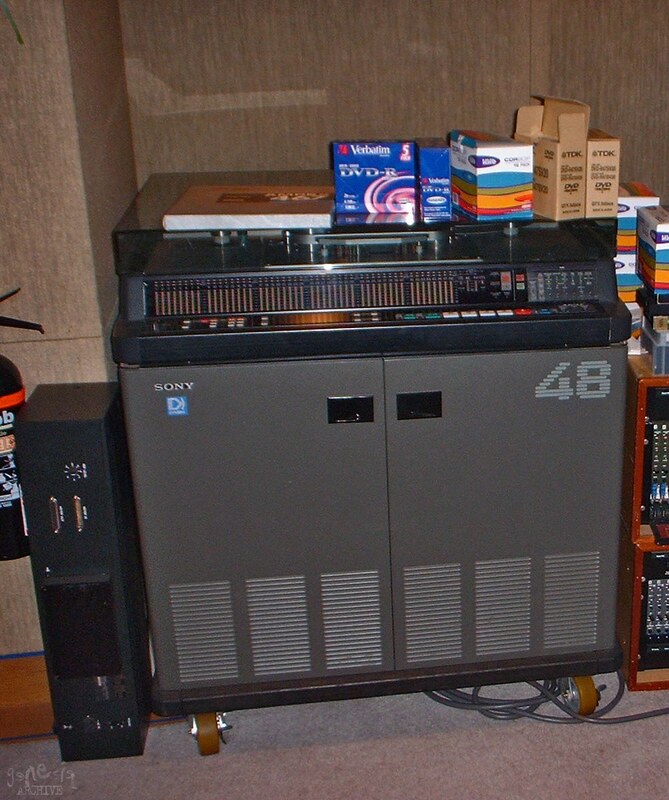 Originally specified to be 24-track Non-Dolby machines when they eventually arrived they were 48-track Dolby and were of such a size they couldn’t get through the doors into the old control room. They were left in the drum booth and Dale Newman built a temporary wall around them. In the meantime, the window from the studio into the new control room was not properly installed so that it had to be taped up to prevent dust from getting into the new room. Finally, attempts by Paul Young to sing lead vocal tracks were brought to a grinding halt by the banging and crashing of the builders who were still working away furiously. 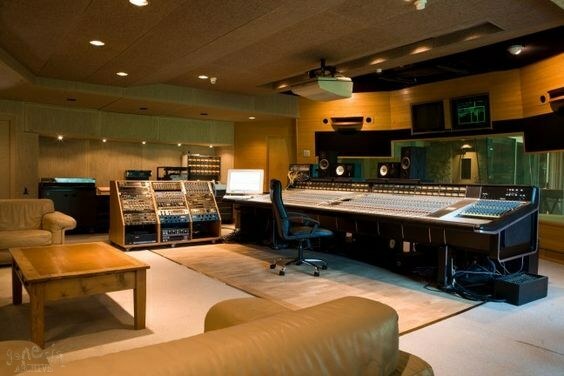 The first album to be recorded using the finished new control room was Invisible Touch. 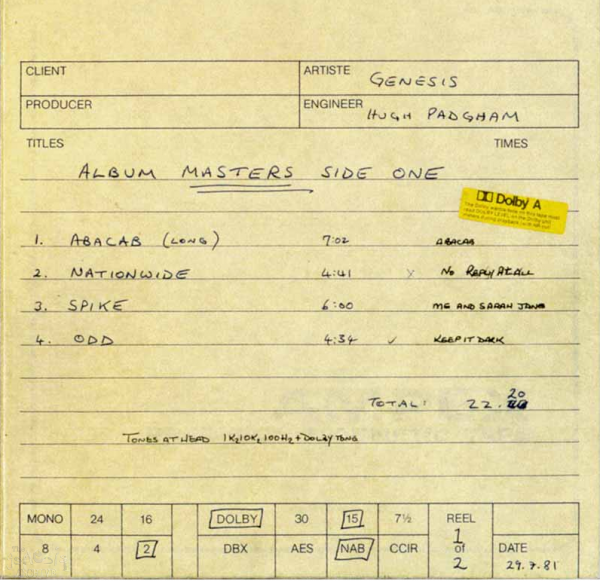 Basically, every Genesis and related project since Abacab has been recorded at the Farm with the exception of a parts of Mike and the Mechanics’ debut album (Silent Running etc), some of which was recorded at Olympic as a result of a scheduling clash. The farm would feature on the BBC TV programme The Old Grey Whistle Test when Genesis were filmed inside recording or playing parts of the album Invisible Touch, it would be a few years before the farm was seen on TV again. The Farm featured in parts of the documentary “Genesis: A History” where Genesis we trying to rehearse for a one off performance at the Nordoff Robbins Silver Clef concert at Knebworth Park on the 30th June 1990, although for the most part Genesis actually rehearsed in the old farm house. Mike and The Mechanics were writing and recording what was to become the 1991 album Word Of Mouth, some small amount of recording of the album is seen in this documentary. The Farm appeared throughout the documentary titled No Admittance about the writing and recording of the 1991 album We Can’t Dance. 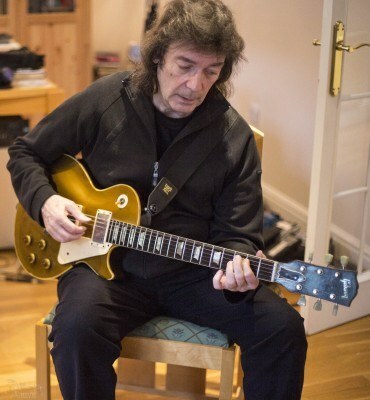 Much of the early work on the albums is done at at the homes of the various musicians using such software as Cubase and for the ‘We Can’t Dance’ album, Phil, Tony and Mike brought into the control room their complete computerised home studio set-ups which were then linked up together and into the studio for the duration of the recording process. 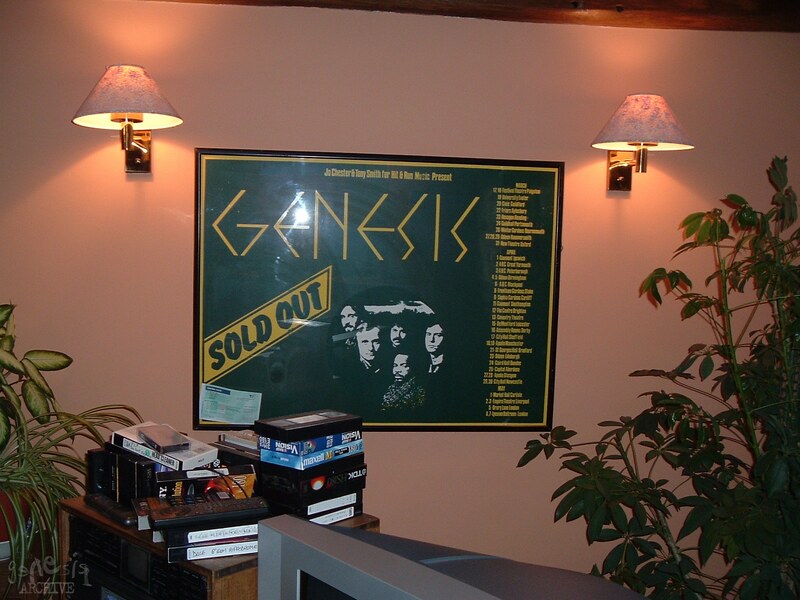 Over the years, the studio has been used by many more than just the Genesis crew. After the shock departure of Phil Collins in March 1996 the future of the farm must have been in some doubt before the news broke that Genesis were continuing with Scottish singer Ray Wilson. That album recorded in 1996/97 and released in 1997 was Calling All Stations. The Farm appears in some VH1 music tv programme about the CAS album and in an EPK of Ray singing parts of the CAS album in one of the rooms at The Farm. Then in 1998 not long after the CAS tour, Genesis announced the delayed Archive box set 1967 to 1975. This box set was compiled at The Farm with Nick Davis and the farm can be seen in another VH1 programme about this boxset. A long haired Nick Davis is seen with Tony and Mike reviewing a mix of The Shrine Auditorium show (1975) at the main mixing desk at FLF. Two years would pass before, Tony, Mike and Phil were filmed talking to camera and rehearsing in the current control room during September 2000 as part of the ISIS production documentary, Genesis: Songbook. The band were performing for the forthcoming performance at The Music Managers Forum where Genesis manager Tony Smith was presented with the Peter Grant Award for music management. In the control room the band can be seen performing an almost unplugged version of Afterglow which featured nicely in the documentary. 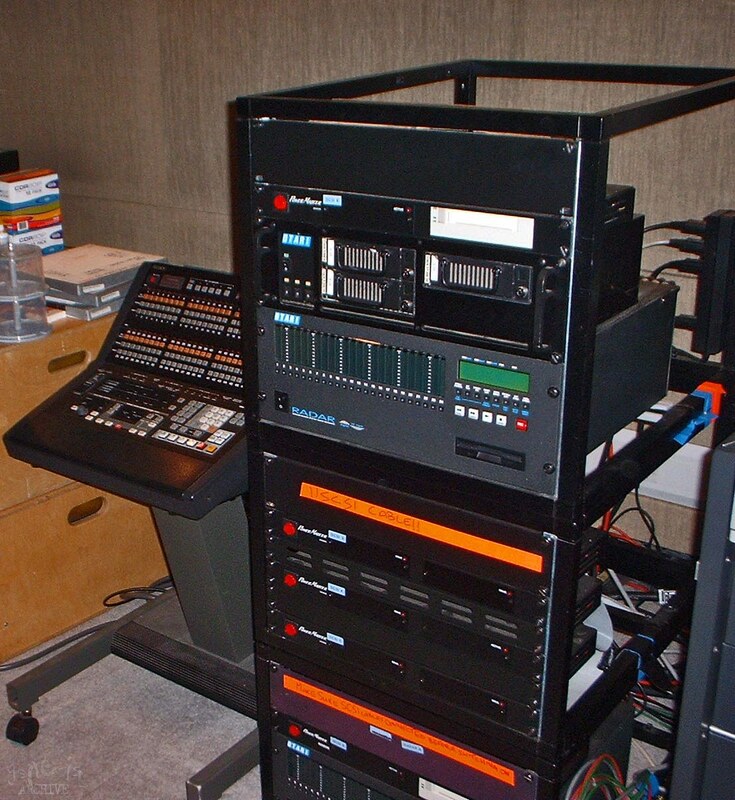 Then in 2001 the former Genesis official webmaster Bill Macormick, was given a tour of FLF by Dale Newman and Geoff Callingham, whilst Mike Rutherford was working in the current control room on the Mike and the Mechanics album Rewired. A rough windows paint drawing and some useful photos were posted on the official website, these are no longer visible owing to the official website being offline. This is a professional drawing of the former cowshed, now a recording studio at FLF Surrey. The Farm at Fisher lane has always been in use by the band since it was first purchased in late 1980 and despite the band being wound down for many years the 1990’s saw Nick Davis who has worked on many projects for the band or the solo careers of the band at The Farm quite substantially. In 1982 FLF was used by Phil Collins to produce the Gary Brooker album – Lead Me To The Water, on one particular recording / writing day… Gary flipped a coin and decided to ring George Harrison and not Eric Clapton. former road crew member Dale Newman remembers it like this: “George was here for a couple of days working on a Gary Brooker album. I got to spend a couple of hours with him alone, which was fantastic. Wednesday 22nd August 2001 – Genesis reviewed the WCD DVD at the Farm it went well with all concerned, expressing satisfaction with the work to date. The quality of the surround-sound in particular was greeted with enthusiasm with one person who has heard the DVD saying “it’s just like being at the concert again”. Present at the review were: Tony Banks, Mike Rutherford, Phil Collins, Tony Smith, Nick Davis and Geoff Callingham. (It was at this visit a DVD Commentary of the concert was recorded). 2nd July 2003, work is ongoing on the surround mix of the Genesis live DVD – Live at Wembley (Invisible Touch tour). Thursday, 11th March 2004 Nick Davis has completed the 5.1 mix of The Lamb and Mike Rutherford and Tony Banks will be giving it the ‘once over’ at The Farm this Friday (12th March 2004). This new version of The Lamb is scheduled for release in May, 2004. (release was then put back to September 2004, owing to changes required by band members). 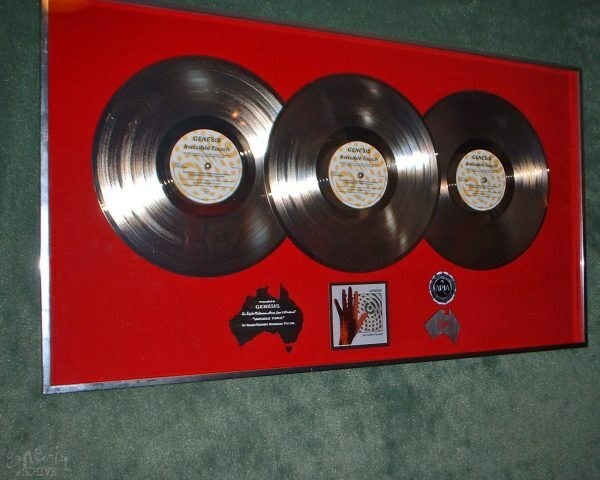 October 25th 2004, The Platinum Collection and The Video show are announced. The Video show contains surround sound mixes of a lot of Genesis tracks from 1976 right up to 1999. This is the precursor to the start of the work on the rest of the bands studio and live album catalogue. 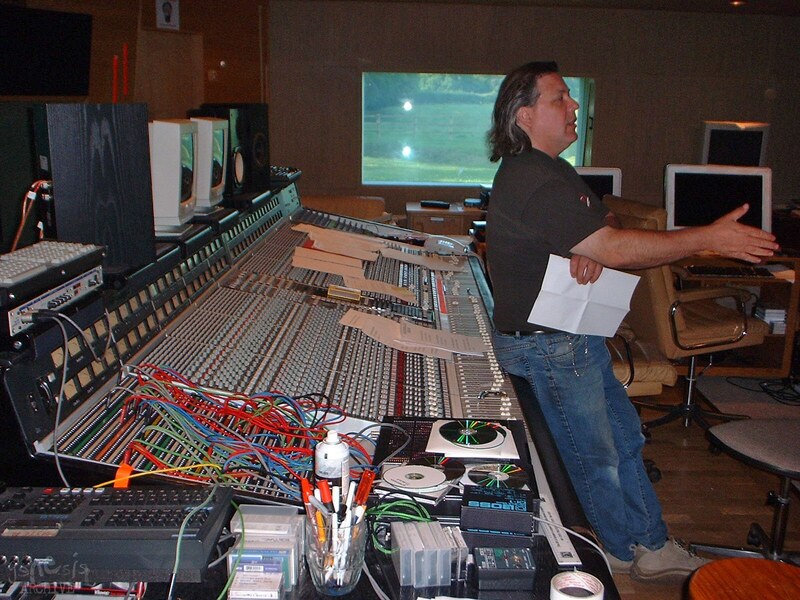 Spring 2005, work begins on mixing the Live Mike and the Mechanics DVD – Mike Rutherford is interviewed at FLF at the same time which appears in the extra’s of the DVD. 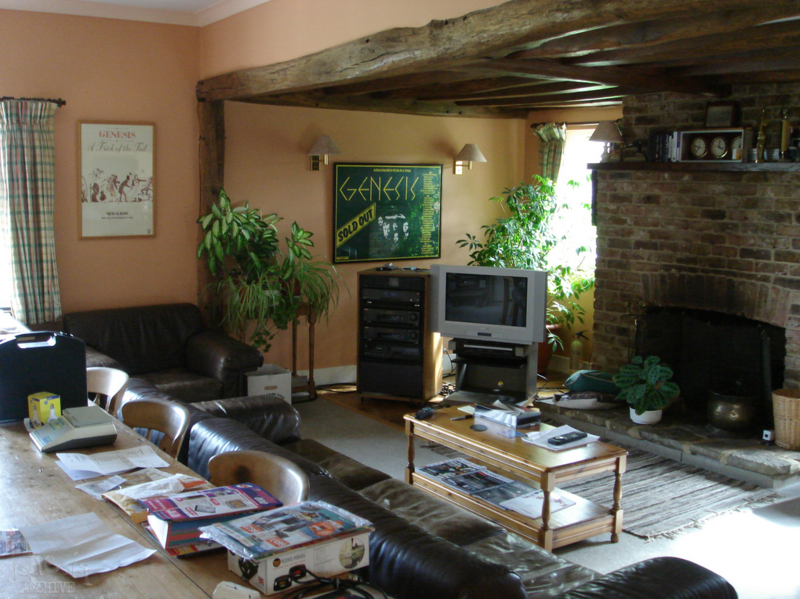 Throughout 2005 and until 2009 all of the box sets the Blue, Red, Green, Live and Movie Box which were properly mixed into Surround sound were all worked on at The Farm amongst other projects such at the 30th Anniversary A Curious Feeling (Tony Banks) which was also given the Nick Davis surround treatment. Tony, Mike, and Phil were interviewed at FLF in late March 2014 as part of a series of interviews for the Eagle Rock documentary – Sum Of The Parts (released Autumn 2014). As part of the realisation of FLF as an asset Genesis have submitted a variety of planning permissions starting from 17th September 2014, it has planning permission to be converting into a residential dwelling. The remaining shareholders of FLF Tony Banks and Mike Rutherford have not proceeded further with this plan. An interview Genesis fanzine The Waiting Room conducted with Tony Banks on the 27th June 2015 demonstrated that FLF was still in use but that Tony Banks had a lot of his Synthesisers and keyboards located in the original control room/editing suite. Former studio manager and guitar tech Dale Newman recorded another album at FLF titled “Dale Newman” and recorded sometime during 2017. Famous German electronica music project SCHILLER has recently been recording or is still recording their new album at The Farm 26th October 2018. Parts of The Farm can be seen in this Schiller video on youtube. Whilst the limited company Fisher Lane Farm Limited is no longer active, the Farm is clearly now the sole domain of Mike Rutherford and Tony Banks whom it would seem have graciously given former studio manager Dale Newman recording time in there. But it’s unlikely that anyone else other than the band members will be recording in there, in effect the studio is hibernated and only coming alive with Tony or Mike wish to do something or if there is some Genesis project that Nick Davis is over seeing. This is an ongoing project that will be continually updated and improved, especially as new information comes to light. If you have anything you would like to contribute please feel free to contact us.